Grace Lutheran Church’s history dates back to 1907 when a group of Woodstock German Lutherans gathered to form a new English-speaking church. As this congregation grew in Woodstock they purchased a church building on Washington Street, across from where you can now find the Woodstock Dairy Queen. 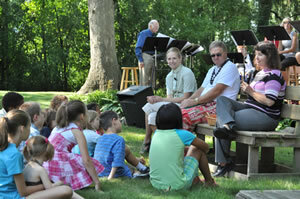 Through the years, Grace Lutheran served and grew in the Woodstock community. As the church expanded it was instrumental in the planting of Lutheran churches in both Richmond and Wonder Lake, Illinois. After decades of ministry and growth, a new building was needed. Our current 25-acre campus at Route 14 and Kishwaukee Valley Road was built in 1983 and expanded ten years later. 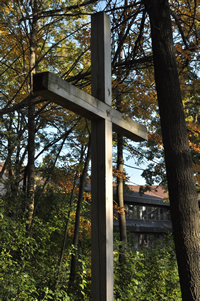 Our campus is handicapped accessible and hosts many community groups each week. 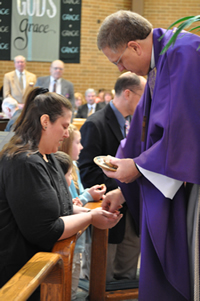 Over the years Grace Lutheran has been served by more than twenty pastors and countless dedicated lay leaders. Our mission for the next 100 years is clear—we are here to share God’s grace. First and foremost here at Grace, we are Christian disciples. More than two thousand years ago God sent his son, Jesus, to our world, where he called together a small group of people to serve as his disciples. Through teaching and modeling a life of servant ministry, Jesus showed what it means to follow him in discipleship. When Jesus died on the cross he saved us from sin and death and gave us the promise of abundant life. As disciples we believe that God has done two things for us—God has given us all that we have, including the resources with which to live; and God saves us from our sins and continues to be our spiritual parent, helping us to live full, meaningful lives. If you are seeking something more in your life than just frantic daily routine, if you want help teaching values to your children, if you would like to be part of a group of people who are open to sharing experiences and opinions, and if you want a place where you can explore your faith and God’s plan for your life—Grace is here for you. But when you start along a journey of Christian faith something significant happens. Your life expands. You discover all the ways that God is already at work in you, and you find out that you are not alone. There are believers all over the world, and we see ourselves as sisters and brothers. As Lutherans, we recognize other churches as legitimate in the sight of God, and we join with others in their ministries—to relieve suffering, to champion justice, and care for all of God’s creation. What does it mean to be a Lutheran Christian? Well, at the core Lutherans believe that we are saved not by what we do or say, but by our faith alone, as argued by Martin Luther himself. Martin Luther is known as the Father of Protestantism. Luther was a lawyer and German monk and was ordained a priest in 1507 in present-day Germany. While continuing his studies he discovered significant differences between what he read in the Bible and the beliefs and practices of the church of his day. On October 31, 1517, he posted a challenge on the church door at Wittenberg University to debate 95 theological issues. Luther hoped the church would reform its practice and preaching to be more consistent with the Word of God as found in the Bible. But what started as an academic debate escalated to a religious war. That day in October marks the most important religious event of the last 1,000 years. It kicked off the Reformation, or the reforming of the church. By Luther’s death in 1546, Europe was divided between Roman Christians and protesting—or Protestant—Christians, led by those known as Lutherans. Today there are more than 65 million Lutherans world-wide. Lutherans still celebrate the Reformation on October 31 and believe in the basic principles taught by Luther: We are saved by the grace of God—not by anything we do, our salvation is through faith alone—meaning we need only to believe that our sins are forgiven because Christ died to redeem us and that the Bible is our source for guidance and inspiration. As a congregation of the Evangelical Lutheran Church in America—the ELCA—we belong to the largest group of Lutherans in the United States, close to 5 million members in more than ten thousand congregations. Our denomination is led by an elected presiding bishop, an elected lay vice president, and church council. Our congregations and ministries are served by more than 18,000 ordained pastors, associates in ministry, and diaconal ministers. Our elected voting members meet in assembly every two years to conduct the business of our church. As ELCA Lutherans we are part of a church body with more than 280 agencies and institutions that are the second largest non-governmental provider of human services in the country. We are part of a church body that maintains 28 church-related colleges and universities, enrolling more than 53,000 students each year. We are part of a church that provides eight seminaries across the country for the training of pastors and other church workers. We help support 400 missionaries in 45 countries around the world. And each year we reach thousands of men, women, and children by providing more than 15 million dollars in hunger relief and other forms of aid, both internationally and at home. 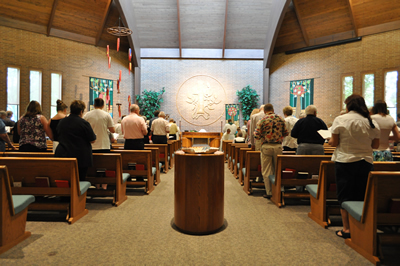 Grace Lutheran Church in Woodstock is also part of the Northern Illinois Synod, one of 65 geographic groupings of ELCA congregations across the United States and the Caribbean. Our synod’s 167 congregations and more than 100,000 members are served by our bishop, synod staff, and scores of others who provide leadership, training, resources, and support for congregations just like ours. 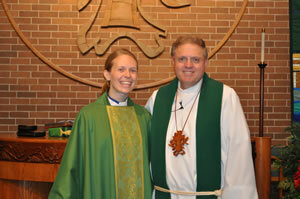 Our synod office is located in Rockford, and Grace is one of the largest congregations in our synod. All this leads us to the mission of Grace Lutheran Church. We gather and serve together to share God’s grace—with each other, with our community, and through our church body with the world—and bear witness to God’s love for all people. The ministries at Grace—our worship and music, our faith education opportunities, our ministry to the community, our small groups and family activities—all exist on the foundation of sharing God’s grace. We offer a variety of worship experiences each weekend, ranging from traditional to informal and upbeat contemporary worship. Faith education and spiritual exploration classes for people of all ages will open your eyes to the Bible and God’s words for today’s world. Hundreds gather each week for PrimeTime on Wednesday nights to enjoy a delicious dinner, learning, music, and fun. We actively engage the Woodstock community, serving the food pantry, Habitat for Humanity, providing care for our neighbors in need and inviting others to learn about God. Through a wide range of activities for children, youth, adults, and seniors we build deep friendships and share our faith. Our pastors, staff and ministry teams will support you and your family as you explore your faith here at Grace. Whether you encounter us in the office, in worship, in Sunday School or Bible study, at PrimeTime on Wednesday nights, or through care from our pastors, we make it our goal to walk with you in your faith journey and to help you discover how God works in you!